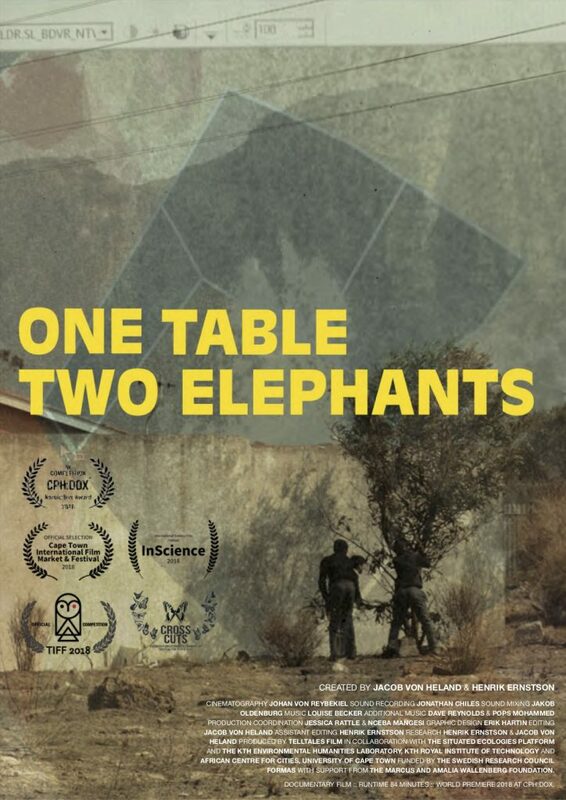 The cinematic ethnography One Table Two Elephants (84 min, 2018) is created by Jacob von Heland and Henrik Ernstson and deals with race, nature and knowledge politics in the postcolonial city. It has been doing really well at film festivals and screenings and we glad and proud with its World Premiere in Copenhagen in March 2018 where it was nominated for the Nordic:Dox Award at CPH:DOX and its African Premiere in Cape Town in October 2018 at Cape Town International Film Festival (CTIF&MF) where it was nominated in the category of Best Documentary Feature. It was also invited, screened and nominated as Best International Documentary at Tirana International Film Festival (TIFF), November 2018, and part of the official selection at InScience International Science Film Festival in Nijmegen in November 2018. Before the end of 2018, it was also the official selection and had its Swedish premiere at CrossCuts Film Festival for the Environmental Humanities in Stockholm, November 2018. As a contribution to Environmental Humanities, Human Geography and critical environmental studies, we consider this film to hold equal weight in academia as a monograph book. The film develops analyses of postcolonial urban natures and a methodology in how film can be integrated as part of research. It was filmed in Cape Town as an integral part of a wider research project and followed by a process of screenings from which we received feedback in the final editing of the film. During 2016 and 2017 we screened a First Cut version of the film (47 minutes) for academics and a general public of over 400 people in Palo Alto, Stockholm, Stellenbosch, Windhoek, Rome and Munich, which provided feedback in editing the final film. We have also screened the film for participants in Cape Town during 2018, at a central cinema and with civil society organisations in Grassy Park. We hope to continue this work during 2019 as a reflective process and develop ways by which the film can be used by participants. We continue this work in the more extensive project on Visual Environmental Humanities. We plan to have the film freely available as of 2020.